We are so happy and honoured to receive Trip Advisor's Certificate of Excellence in June 2018 recognizing our unmatched, sincere service and quality of accommodations in Coronado, Panama. We invite you to come and experience all! Back to the casa and casitas: We've recently done our yearly upgrades and all the casitas are fresh, new paint new art, new beds! The pool has been freshly painted again, the main home remodeled, the casitas painted and kitchens fully furnished … You will enjoy new cozy sheets, towels, pillows and fresh casitas! even down to salad spinners and veggie peelers, all pots/pans, sharp knives.. full size fridges/stoves/micro/toaster oven.. everything needed to cook a gourmet meal in your casita, or join the other guests outside for a BBQ! ! I also provide all kinds of spices and condiments etc, so you don't need to start from scratch. Coffee and sugar starter kit will also be waiting for you as well as a welcome beverage! Fully equipped casita with high speed wifi, cable tv, a/c, King or Queen bed, comfy updated furnishings. We welcome your feedback, always and take suggestions and improvements very seriously. We are always available to assist our guests with anything you need. If your casita is missing something, or there is a maintenance issue, it’s appreciated that we are informed right away for a speedy resolution. Only 3 Blocks Before Coronado Hotel and Golf Club and just a few Blocks to the Beach. This Property is very well located, Very Homey. This is a Panamanian Household.. full of love and soul and a fun and friendly vibe that is unparalleled in the area. The fully equipped casitas also offer the privacy for guests. This is NOT a resort or impersonal hotel, but has all amenities that you could need or want for cooking, relaxing, swimming, playing. Owner is Canadian, Caretakers are Panamanian. ..we also have an english speaking property manager and english speaking drivers , all accessible easily by phone and/or email if I am not present during your rental. Our team of hospitality professionals are committed to providing wonderful guest service. We are always happy to provide all kinds of concierege services. From airport pickup, area or city tours with the awesome and famous driver Pedro or Johanny, to car rental, golf cart rental.. anything you need! I have learned a great deal and developed the BEST contacts in my 13 years in Panama that I happily pass on to my guests, and potential relocaters. “Everyone deserves a world class greeting!” With over 30 years of Property Management and Vacation rental experience in Canadian Ski resorts and Mexican Beach resorts, I am now focusing on investing, renovating, furnishing and renting my own apartments and properties. One stop shopping with this Canadian owner having 13 years in Panama and mucho experience in investing, renovations, buying and selling realestate and have great contacts for everything you could imagine (doctors, dentists, lawyers) and is happy to help with restaurant recommendations and excursions outside of Coronado. * I also have 3 rentals in Panama City so we could create a package for you I am also a Buyer's Consultant with a reputable REAL ESTATE company in the Coronado Area. I have helped many people realize their retirement, relocation and investment dreams, and I have wonderful contacts in just about any field you can think of. I am happy to help you with everything Panama! My clients and renters have become great friends and we socialize and network regularly and many have kept in touch long after departing. There are definite and unique benefits to dealing directly with the owner with regards to service level, property maintenance, and of course price (when there is no 'middleman'). As well as enjoying my small and personal rental business, I am a realtor in the Coronado area and I’m happy to have my “brains picked” in anything Panama relates. Bienvenidos! Welcome. Enjoy tropical beaches and beautiful sunsets In the vibrant beach community of Coronado, Panama. Great restaurants, shopping, state of the art medical care and every amenitie you can imagine – or chill out in your garden with the butterflies and hummingbirds, swim in the pool, play ping pong teach the parrots new words and in the evening, flip the switch for the beautiful palm lights and BBQ. It’s all here! Private garden and pool.. entertaining parrots to talk to.. ping pong, wireless internet, board games, boogie boards to use, and a lovely family of caretakers (with their own apartment on the property) who provide security and yard/pool maintenance.. Very close proximity to golf and beach. 200 megs internet, high speed! Fully equipped! You have your own private kitchen, or feel free to use the outdoor BBQ at the pool. The property was so peaceful and welcoming from the moment we arrived. We stayed in the larger casita which was well equipped with kitchen items. Since we wanted to cook and be nearby everything, we definitely stayed at the perfect place! Julie, the owner's assistant helped us get settled in right away. The pool felt so refreshing after a day in the hot sun and is just beautiful with all the surrounding palms and greenery. We just loved our experience! Clean and comfortable and a good price. Didn't get a chance to use the pool but it looked wonderful, very well kept. Close to town as well. We enjoyed our stay. We stayed in the Casa Gaviota Casita for 4 weeks. Sarah may have the nicest backyard in Panama! 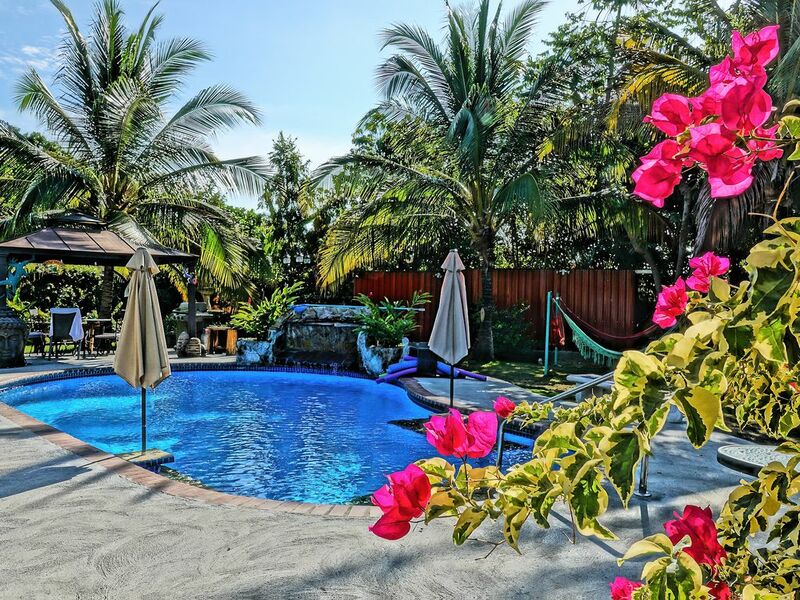 There is a beautiful pool with waterfall, an outdoor covered BBQ and dining area, Palm and Banana Trees, hammocks, and ample lounging area in the sun or in the shade. There is a concrete ping pong table that is fun to play. Lots of birds, flowers, and the occasional iguana to enjoy. You share these areas with other guests, folks come and go depending on their length of stay. The seemingly endless stunning black and yellow sand beach is an 8 minute walk away. The Coronado Golf Course is a 5 minute walk. We played 10 rounds on a very nice Tom Fazio layout, highly recommend. Thank you Sarah and Scotty for a fantastic visit! What a great time! Sarah arranged for a driver, Pedro, to pick us up at the airport and he was great at giving us a tour on the way to Coronado. Sarah arranged a car rental at the casita for us and provided excellent advice on must see spots! We did go fishing on a charter, thanks Sarah for the great tip! We especially enjoyed hanging around the pool and met some amazing people at happy hour! The Casita was clean, the bed was super comfy; we had everything we needed to prepare our own meals. The grocery store was close by and had some great deals on fruit and meat, ok and the beer was super cheap! I want to bring some more friends back to Coronado next year and I will definitely be booking with Sarah! 6 weeks of laughter, friendships, sightseeing, what more could you ask for at Panama Sarah's. Sarah and her boyfriend Scotty are exceptionally generous and accommodating people, as well as Vilma the maid and Jose the gardener. We couldn't have chosen a better place to stay while continuing our research into emigrating to Panama. A beautiful pool in a gorgeous garden with a waterfall and communal BBQ and a great casita with a full kitchen. We enjoyed the daily entertainment by the chachalacas and parakeets. Only a 10 minute walk to the beach where you can walk for a few miles and be entertained by the hundreds of pelicans. We do recommend having a car, but at the end of the road you can catch a local bus into the town of Coronado for 35 cents, where you can catch a bus to anywhere in Panama...a great system. It was a very sad day when Pedro, the driver Sarah recommends, came to pick us up to take us to Tocumen Airport in Panama City to fly home. We will definitely be back to visit our friends Sarah and Scotty...thank you so much. I couldn't have picked a better place to stay in the area !! Sarah and Scotty are super hosts that make you feel at home before you even arrive. They are always there to help you with any questions you may have about absolutely anything and are happy to let you know about any local events that may be going on !! A car does make things easier but the bus service is close and is very cheap and efficient ! The set up with Casita's is perfect for meeting new people, forging awesome new friendships, and having much fun and laughter! It feels like being home I was there for 6 weeks and can say it was truly a great experience at their properties. The casita's are clean and very comfortable plus have all you need ! Through her travels Sarah has picked up so many pieces of artwork that all adds to the decor throughout the property. Having the beautiful pool with waterfalls and floaties is perfect ! The BBQ area by the pool is a perfect spot to socialize and relax in the evenings with all the new friends you meet once there :) I would highly highly recommend staying here.